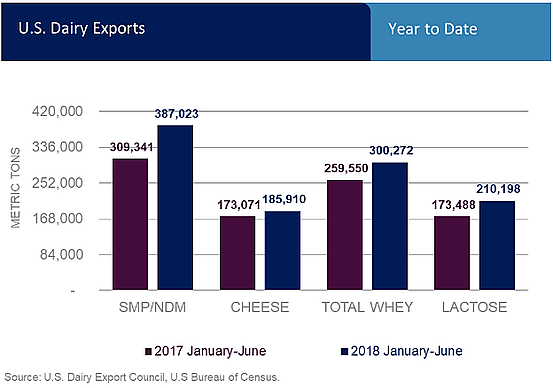 In the first half of the 2018, U.S. dairy exports of milk powders, cheese, butterfat, whey and lactose topped 1.14 million tons, a record-high and up 20 percent from the prior year. Significantly, U.S. suppliers accomplished this by building market share and competing favorably for business against European and Oceania suppliers, increasing their share of global exports of major commodities from 17 percent in 2017 to almost 19 percent in the first half of this year. Overall global import demand was good early in the year, driven by strong economic growth in dairy import countries. World trade of milk powder, cheese, butterfat and whey was up 7 percent in the first four months of the year, before slowing in May and June to finish the half up 3 percent. Lower global prices in the first quarter of 2018 (compared with the second half of 2017) helped bring buyers back into the market, particularly to support supply chain pipelines for milk powder and whey. The data shows that the major growth in global import demand in the first half of the year came from the Middle East and North Africa (MENA) region and Southeast Asia, offsetting a slowdown in China demand growth. Demand growth occurred in the primary U.S. export products. Looking at skim milk powder, cheese, whey and lactose, which account for nearly all U.S. dairy exports, world trade was even better—up 7 percent in the first half. U.S. pricing was relatively favorable. In the first half of the 2018, U.S. benchmark prices for cheese, skim milk powder and whey were competitive to those of New Zealand and the European Union. In addition, overseas markets often offered U.S. suppliers better returns than the domestic market. Moreover, a slowdown in U.S. domestic sales has led to a continued inventory build-up, notably in cheese, and it remains critical U.S suppliers maintain and continue to build overseas sales to support milk values. As a result, increased market share. 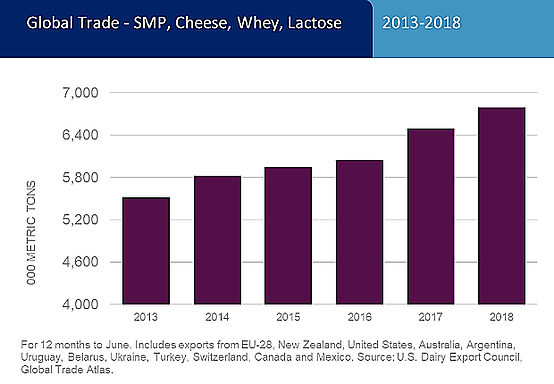 U.S. dairy exporters won share from European Union suppliers in Southeast Asia on both skim milk powder (SMP) and whey products, on top of growing overall volumes. In addition, U.S. dairy exporters secured share vs. the European Union on cheese exports to South Korea, lactose to China and SMP to Mexico. The U.S. also gained share vs. New Zealand on SMP exports to China. Less excess from New Zealand. Kiwi milk production was flat last season, avoiding additional production to be off-loaded in global markets. Rebound in crude oil prices. Oil prices were up 37 percent in the first half compared with a year ago, even as dairy commodity prices were mostly lower. Higher oil prices help drive MENA region dairy imports. Conditions were favorable for U.S. exporters to succeed, but suppliers still had to put themselves in position to capitalize. U.S. exporters are gaining growing recognition as both competitive and committed suppliers in new and growing markets – demonstrating a long-term commitment to servicing their customers, and providing the right product, the right package, and the right specs to meet individual market/buyer needs. U.S. suppliers face some additional headwinds in the second half, with the potential slowdown in global dairy trade, a stronger dollar, less-competitive relative pricing, expected robust production from New Zealand and other milk sheds, and continued uncertainty around the trade dispute with China and its broader implications. The recent announcement of resolution to NAFTA and prospective announcement of agreement with Canada should bode favorably for continued expansion of trade with our neighbors, notably Mexico. With the market environment expected to be less favorable in the months ahead, U.S. suppliers will have to work that much harder to build on first-half gains, particularly with an aim to build broader geographic diversification of our export destinations. July U.S. export numbers are released Wednesday, September 5, providing the next set of data points for 2018.